"The first focused chat exchange for language learning." 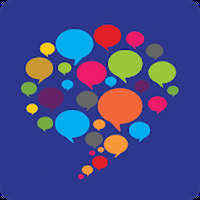 App description: Learn more than 100 languages ​​with the help of this app that works like a social network. Functions: You can chat with people from all over the world to improve your chosen language, for example English, French, Japanese, etc. Rating: The TOP 5 Most popular Apps in Learn German category. Do you like HelloTalk Learn Languages Free? Good Very good idea and its realization! Great App! I love this app so much! ?? ?? ?? ?? ?